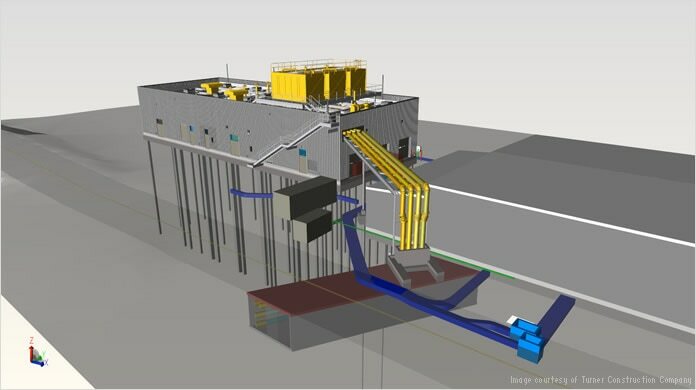 Turner Construction Company of New York used Building Information Modeling (BIM) for the construction of a US$26 million central utility plant for the Oakland International Airport. Autodesk BIM solutions supported information collaboration and improved construction efficiency for the plant housing the complex systems that keep the airport running 24 hours a day. BIM helped Turner improve collaboration with the architect, client, and subcontractors. The extended team was able to quickly discover problems, collaborate on solutions, and keep the project moving forward. The intelligent model helped the team reduce guesswork. Using a single model meant no one had to guess which version was current, minimizing time spent correcting the design. The entire team used BIM 360 Glue cloud-based BIM collaboration software, saving time and money through improved coordination. Mobile access provided all team members with anytime, anywhere access to project visualizations.